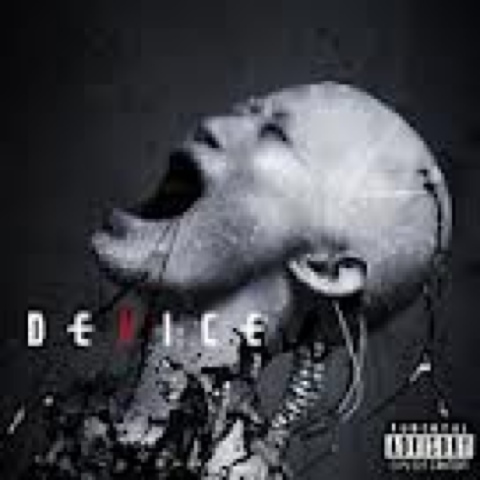 Device is a new project featuring Disturbed's front-man David Drainman and former Filter guitarist Geno Lenardo. Word has it that back in late 2011/early 2012 (after David's band went on hiatus) the former Filter guitarist approached David about doing some work for the latest "Underworld" soundtrack. One thing lead to another and the next thing you know every one's talking about this "new heavy metal" band called Device. Of course I also distinctly recall hearing that Device was also a "super group". Uh oh. Whenever the word's "heavy metal" and "super group" appear together there's usually lots of hype with little in the way of actual payoff. Before I get into this single though let's put one rumor to rest. Bothers and sisters let me tell you something. Being called a "heavy metal band" doesn't necessarily make you a heavy metal band. This is not "heavy metal". Could Disturbed even be described as a heavy metal band? I never considered them to be one. I'm not saying that they aren't heavy. They are. I'm just not sure I'd call them "heavy metal". Maybe nu metal meets alt. metal? I don't know, but they're not a heavy metal act in the strictest sense of the word. And we know that that Filter wasn't either (or still isn't if they are even still around). Instead the pair, who started working on this album in June of 2012, have released what you'd expect this pairing would release. In other words its David Draiman playing in an industrial act. N.I.N, Ministry and Skinny Puppy are the likely influences. This sounds insanely like industrial metal from the late eighties/early nineties. I can't say for sure the whole album will be industrial metal. The new album is supposed to have quite a few quests so who knows? "Vilify" itself is a cool number. I've always like David's vocals. Am I saying I'm a closet Disturbed fan? I wouldn't go that far. There's some songs of theirs I like. It's funny, but when I hear Disturbed I think of this Italian cat named Tino (where are you my friend?) who was heavily into Disturbed. Of course he was also into Iron Maiden, Anthrax, Slayer and Pantera so he had good tastes. Anyway, he always tried to get me into Disturbed. I actually find that I like David's vocals in this form better. Call me crazy. I'm used to it. But yeah, David sounds wicked here and while this album, which is expected in April, might not be all it's hyped up to be this tune is fun. I'll probably get the album one way or the other so expect a review of it much later one. "Vilify" is certainly a song to get if you're into the likes of N.I.N., KMFDM, Ministry and maybe even Skinny Puppy.